Below is a list of our wood choices. Other types of wood may be available upon request. These wood choices are availiable unfinished, prefinished and prestained. An unfinished picture of each wood is shown, along with a description and some of the products for which it is offered. American cherry wood is a light to medium-weight hardwood that owes its popularity to its beautiful finish. The fine texture, straight grain, and strength of this wood allow it to sand to a smooth, glass-like finish. American cherry's heartwood is a very warm reddish-brown, adding a visual richness wherever it is found. The sapwood is an off white, tan color. Products available in American cherry include butcher block countertops, end grain butcher block countertops, plank countertops, stair treads, mouldings, hardwood flooring and more. Ash wood has a light brown color and a fairly uniform, straight grain. Its coarse to medium texture - not unlike Oak's - finishes and stains well, making it a popular utility hardwood choice. The range of neutral, light browns in this medium-weight wood make it an ideal selection for a background wood. Products available in ash include butcher block countertops, end grain butcher block countertops, plank countertops, stair treads, mouldings, hardwood flooring and more. Beech is a fair, blond wood with a fine, consistent grain. It is a heavy, strong, durable wood that also stains and polishes very well. This medium-weight wood is a great value and blends very well with any room's decor; the light shades of Beech (similar in appearance to birch and maple) lets it fit in anywhere. Products available in beech include butcher block countertops, end grain butcher block countertops, plank countertops, stair treads, mouldings, hardwood flooring and more. Brazilian cherry wood, or jatoba, is a heavy, dense hardwood with a range of color from a light orangeish-brown to a uniquely deep reddish-brown. It is sturdy and durable, with a medium to coarse texture and an interlocking grain. Brazilian cherry offers a good natural luster and is an excellent selection for furnishings and room accents. Products available in Brazilian cherry include butcher block countertops, end grain butcher block countertops, plank countertops, stair treads, mouldings and more. Hard maple is one of few woods where the sapwood is used more often than the heartwood. The sapwood of Hard maple is an off-white or cream color; a very light hue with a slightly yellow tint. This strong, medium to heavy hardwood usually has a straight grain, although it may be wavy, and offers a fine, even texture. Products available in Hard maple include butcher block countertops, end grain butcher block countertops, plank countertops, stair treads, mouldings, hardwood flooring and more. The color variations in hickory, from reddish-brown, to light brown and blond, add a lot of interest to this strong, durable wood. The grain is most often straight, but can sometimes be wavy. Along with the variable color profile, the coarse texture of this heavy wood adds character to a room or piece. Products available in hickory include butcher block countertops, end grain butcher block countertops, plank countertops, stair treads, mouldings, hardwood flooring and more. Knotty alder has a welcoming reddish brown tone that can look similar to cherry wood. It has a straight, fine grain and an even texture, but it can also have open knots, and small and large split knots that may go completely through the wood. A lightweight wood, Knotty alder is warmly hued with an all-natural look. Products available in Knotty Alder include butcher block countertops, end grain butcher block countertops, plank countertops, stair treads, mouldings and more. A lightweight wood that is also strong, durable, and known for its reliability, Knotty pine is a warm, light brown with yellow undertones. The small, tight knots found throughout the wood give it its signature rustic look. Knotty pine features a fine, uniform texture and a straight grain that contributes to its stability. Products available in Knotty pine include butcher block countertops, end grain butcher block countertops, plank countertops, stair treads, mouldings and more. Mahogany is characterized by its deep, rich, reddish tones that deepen with age. It offers a grain that may be straight, interlocked, or wavy and irregular. A very workable wood with a coarse grain, it is durable and stains and finishes well. Light to medium in weight, Mahogany is an all-purpose wood known for its beautiful, warm tones. Products available in mahogany include butcher block countertops, end grain butcher block countertops, plank countertops, stair treads, mouldings, and more. One of the most widely used utility hardwoods in the U.S., poplar is characterized by a light cream or yellowish brown hue, and a straight, even grain. The medium texture of this lightweight wood is one factor that makes it easily workable, and the light coloring brightens any space. Products available in poplar include butcher block countertops, end grain butcher block countertops, plank countertops, stair treads, mouldings and more. The ever-popular Red oak wood is often chosen due to its excellent finishing qualities, as well as its ability to stain without blotching. This medium-weight, straight-grained wood has a coarse, open-pored texture, and great stability. The brown and reddish-tinged heartwood of the Red Oak means it will lend warmth to any room. Products available in Red oak include butcher block countertops, end grain butcher block countertops, plank countertops, stair treads, mouldings, hardwood flooring and more. Quartersawn woods are cut precisely to provide a wood with consistent grain and extra stability. Combine this with Red oak's well-known top-notch finishing, sanding, and staining qualities, and you have a customer favorite. The invitingly warm, reddish-brown tint of this medium-weight wood works in every type of room. Products available in Quartersawn red oak include plank countertops, stair treads, mouldings, hardwood flooring and more. White oak is a strong, durable, medium to heavy wood with a coarse grain, and for these reasons is favored by cabinet makers and homeowners alike. It offers a light to medium brown tone that makes it an excellent choice to blend with any decor, in any room of the house. Products available in White oak include butcher block countertops, end grain butcher block countertops, plank countertops, stair treads, mouldings, hardwood flooring and more. Quartersawn woods are cut in a method designed specifically to leave them with a consistent grain and extra stability. 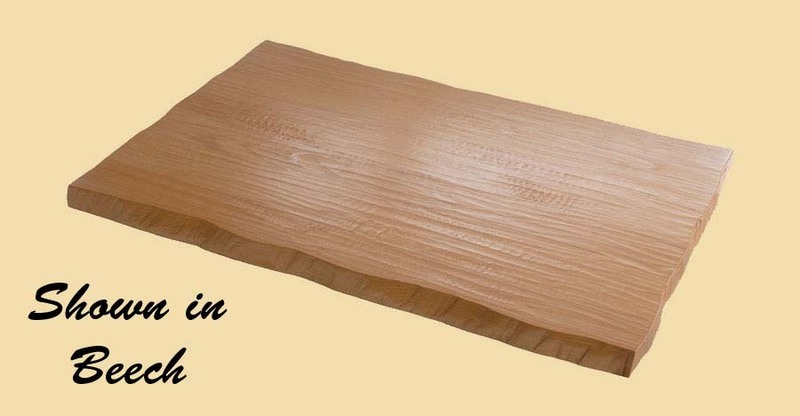 This enhances White oak's strength and durability even further, making it a very stable wood. The light to medium brown hue makes this medium to heavy wood a popular choice for all home applications. Products available in Quartersawn white oak include plank countertops, stair treads, mouldings, hardwood flooring and more. Soft maple wood has a light, warm brown hue to it, and offers both strength and density. It is a medium-weight wood with a fine, close-grained texture, and finishes well. Soft maple is an excellent light-colored wood, ideal for highlighting a room with plenty of natural light. 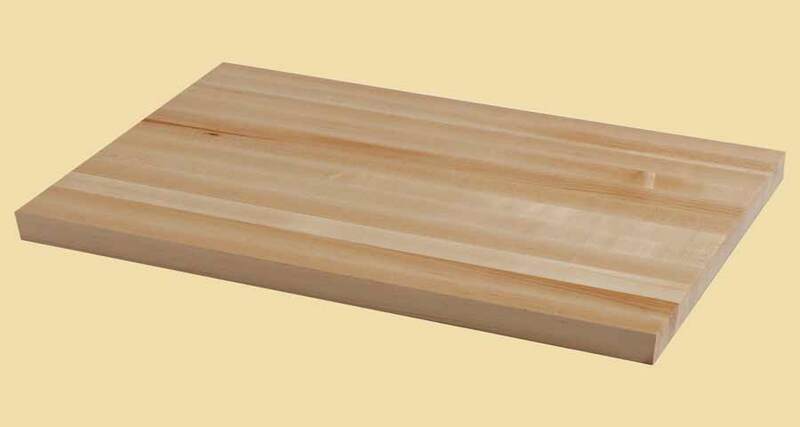 Products available in Soft maple include stair treads, mouldings, and more. Spanish cedar has a light pinkish to reddish brown color that deepens with age and exposure. Its straight grain, medium texture, and natural luster make it an attractive choice for homes, and its distinctive odor makes it uniquely suited to use in closets and other storage spaces. Lightweight, but durable and strong. Products available in Spanish cedar include butcher block countertops, end grain butcher block countertops, plank countertops, stair treads, mouldings, and more. Walnut is prized for its deep, rich brown hues. The heartwood ranges from a light brown to a chocolate brown, and the wood offers a straight grain with plenty of character, featuring figured grain patterns such as curls and burls. Medium texture and natural luster completes this much-admired, light to medium-weight wood, which is a perfect choice to accent any room. 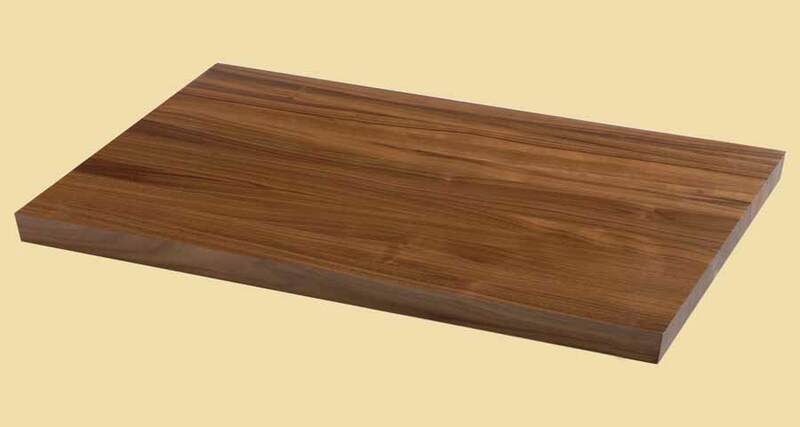 Products available in walnut include butcher block countertops, end grain butcher block countertops, plank countertops, stair treads, mouldings, hardwood flooring and more.